As some of you may have noticed, my presence on Wattpad has been growing the last week. With Fear Games’ premiere last Monday, and posting the first chapter of The Long Road Home as a preview, I’ve been attempting to draw in new readers. Part of the reason I chose to do Fear Games as an online miniseries on Wattpad is due to the growing popularity of books on the site. The interactions with readers in phenomenal. In fact, many of the readers on Wattpad are kind, dedicated, and optimistic any time their favorite writer adds something new. It is an environment I’m truly happy to be part of now, and I look forward to seeing you there. You can find the premiere of Fear Games right here. You can find the first chapter of The Long Road Home right here. Feel free to subscribe to my page here. I’ve also been a lot more active on Instagram. You can find me here! So many of you have seen me making posts about something called Fear Games that I’ve been working on. I’ve been holding off on making an official announcement, but now is the time! Fear Games is a story I originally came up with in fifth grade. From there, it’s sat in my head and taken on a new life. Last year I tried to revive it on Wattpad, but unfortunately, because life got in the way, I was never able to finish it. In the coming weeks, I will hopefully have a bigger update for you. As of right now, all I have is the synopsis for the serial drama. Rachel never thought her past would catch up to her. When she and her friends are invited to a new haunted house on Halloween, she expects it to be a night of fun. Before she has a chance to realize what she’s gotten herself into, her friends begin dying at a rapid pace. Someone is after them. Someone out for blood. Someone out for revenge. As Rachel races to find the truth, she learns that the reason for these murders may be connected to her in a way she never expected. Will she be able to find the killer in time before they make their own move on her? Or will everything she ever loved come crashing down around her? With this story, I am going to be doing something a bit different. Each of the new episodes of this serial drama (written as 12 different short stories) will be published through Wattpad so they will be available to everyone for free. Once the series is all done, if fans want physical copies, I will pursue publishing it. The first episode is titled “Let the Games Begin,” but unfortunately this is all the news I have at the moment. I look forward to giving you more news in the future! Today is the beginning of a new writing project that I’m very excited about. A few years ago, I came up with the idea for a horror story called Fear Games. After re-writing it several times, I realized this is the direction I want to go with the story. At first, I wasn’t sure what I wanted to do. Did I want to self-publish it or publish it through Booktrope? Eventually, I came to my decision. I am writing it as a serial on Wattpad. This means that you don’t get the story all at once, but rather, I update it as I go. This seems like something I’d be very cautious of, but because I have it all planned out, I have no doubt in my mind that it’ll work. The Fear Games are on. Rachel, Esmerada, David, Alex, Ryan, and Kelly all have seemingly normal, but separate, lives. Until an invitation to Fear Games, a new haunted house in town, brings them all together. At first it starts out as fun, but when one of them nearly dies, they realize the house is more than what it seems. And they’re all locked inside. Someone inside the house wants them to remember. Something that they all did. When people start to die, the group realizes this is no longer a game. As the pieces of the puzzle start to fall into place, Fear Games brings you a dark morality tale that will leave you speechless. Because it’s on Wattpad, I didn’t have very many cover options. 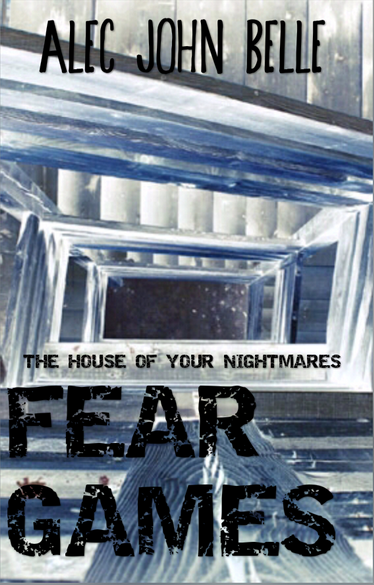 But this is the cover I’ve created for Fear Games. This series is also very short and will only consist of ten parts. By the time it’s finished, it’ll be about the size of a novelette. If this series gets enough notice on Wattpad, I may self-publish it on Amazon or I may publish it through Booktrope. I’m kind of indecisive about that as of right now.